The Finale – Day 2 | Finally, then . . . It was the Day of the Lord and I was in the Spirit when suddenly I heard a loud Voice from behind me. It shook me like a trumpet-blast. I turned around to see Who was speaking, and there, standing among seven gold lampstands, was the Son of Man. He was wearing a kingly robe with a gold sash across His chest. His head and His hair were white like wool, as white as snow. His eyes blazed like they were on fire and His feet were glowing like bronze just taken from the furnace. His voice thundered like a mighty waterfall. In His right hand He was holding seven stars, and out of His mouth was a sharp two-edged sword. His face glowed like the sun shining in full strength. 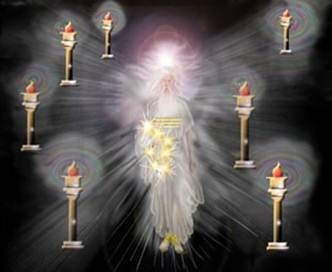 “This message comes from the One Who holds the seven stars in His right hand, and Who walks among the seven golden lampstands. and that you hate the immoral deeds of the Compromisers (Nicolaitans) as I do. “But I hold this against you: you have left your first love. “Remember how it was when you first believed. Return to loving Me as you did then. If you don’t do this, I will have to remove your lampstand. “This message comes from the First and the Last, Who was dead and has come to life again. the slander you endure from those so-called Jews who are a synagogue of Satan. the distress will last for ten days. “Be faithful in the face of death and I will give you the crown of life. “This message comes from Him Who has the sharp two-edged sword. that your trust in Me didn’t waver even when Antipas, My faithful witness, was martyred before your eyes by Satan’s cohorts. Some among you encourage moral compromise like Balaam did when he showed Balak how to seduce the children of Israel into doing evil. Others in your group are caught up in the deception of the Nicolaitans. “These had better repent quickly or I will fight against them with the sword of My mouth. “This message comes from the Son of God Whose eyes blaze like fire and Whose feet shine like pure bronze. that you are doing even more now than you did at first. “But this I hold against you: you tolerate that pseudo-prophetess “Jezebel” who deceives My servants with her seductive words, leading them into sexual immorality and fellowshipping with idolaters. “I have given her time to repent but she has no desire to change her ways. Watch! I will throw her and her children onto a sickbed and they will suffer unto death unless they repent. Then all the Churches will know that I see into the secret places of men’s hearts and that I reward each according to their deeds. “For those of you who haven’t fallen into her trap and learned “the deep things of Satan,” I simply ask that you hold on to what you have until I come. “This message comes from Him Who holds in His hand the seven Spirits of God and the seven stars. “I know about all your activity, which gives you a reputation as being alive when, in fact, you are quite dead. Strengthen what little you have before it dies: you start so many things but never follow through. Think back to what you learned and received at first: take hold of those things and act on them. “If you refuse to wake up, I will come to you like a thief; you’ll be caught completely by surprise! “I know the names of those few left in Sardis who have “kept their garment clean.” They have earned the right to walk with Me in radiant glory. “This message comes from the One Who is holy and true, Who has the ‘key of David,’ the One Who opens doors so none can shut them and shuts doors so none can open them. “I know how much you have accomplished. Because you have been faithful to My message and not denied My Name but have used what little you were given to do so much, I have set before you a wide open door of opportunity that no one can close. Those liars who claim to be Jews but are really of Satan’s synagogue will bow down before you and be forced to admit that I have loved you. Since you’ve obeyed Me so thoroughly, I will keep you safe from the deep trouble the rest of the world is about to face. “I am coming back soon; hold on to what you have and don’t let anyone steal your crown. “This message comes from the Amen, the Faithful and True Witness, the Founder of God’s creation. “I know all about your activities; they are neither hot nor cold. I wish you were cold or hot; but since you are lukewarm, I will spit you out of My mouth. “You think of yourself as prosperous and quite successful. You’re blind to the fact that you are actually wretched, miserable, poverty-stricken, blind, and naked. Buy from Me that gold which is purified in the furnace so you can be truly rich. Clothe yourselves with My white garments to cover your shameful nakedness. Ask Me for salve to heal your blind eyes. “I always correct and discipline those whom I love. Shake off your complacency. Humble yourself. Repent! I’m standing, knocking at the door. Listen! Do you hear My voice? Let Me into your life, and let us commune together.